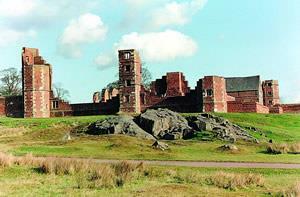 Bradgate Park is Leicestershire's largest and most popular country park. It comprises of 840 acres of land with grass, heath, bracken, rocky outcrops, small woods, herds of deer and the River Lin. The Park also includes the ruins of Bradgate House, the birthplace and early home of Lady Jane Grey 1537 - 1554 (Nine Days Queen of England.) Old John Tower folly, a well known Leicestershire landmark, stands on the ridge of high land. Disabled access along tarmac path through centre of park. All-terrain mobility scooter available for hire. Drive-through scheme for Blue Badge holders - contact us for details or visit our website. Check our website or pick up a leaflet for details of our guided walks and events programme. Bradgate Park is open to visitors from 7.45am until dusk on every day of the year. The car parks are closed at dusk and all vehicles must be removed by then. Bradgate Park has three entrances: the main entrance in Newtown Linford. Also Cropston (Hallgates) and Old John (Hunts Hill). Swithland wood has two entrances, north and south.